Identification: Young animals are brown, densely frosted with white flecks. The white pigment forms a "pathway" that runs down the center of the notum and branches onto the bases of the cerata. 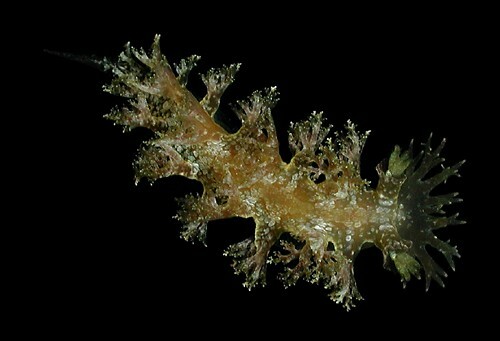 The rhinophore sheaths lack ruffles and the processes on the oral veil are slender with symmetrical downward-facing branches. As the animals mature, the white pigment becomes patchy obscuring the "pathway," the processes on the oral veil become thicker and more irregularly branched, the rhinophore sheaths become ruffled and the rhinophores develop a greenish tinge. In old animals, the cerata may develop a bluish tinge and the notum may become weakly pustulate giving it a "quilted" appearance. Natural history: Marionia hawaiiensis is a common species found in moderately protected to highly exposed rocky habitats at depths of < 1 to 5 m (< 3 to 16 ft). It feeds on the octocoral Sarcothelia edmondsoni. Its egg mass in a "kinked," bright orange spiral. Hatching may occur in as little as three days in the laboratory. Distribution: Big Island, Maui, Oahu and Kauai. Taxonomic notes: This is the species listed as Tritonia hawaiiensis Pease, 1860 in Kay, 1979 and Bertsch and Johnson, 1981. It was first reported from Hawaii in Pease, 1860 and is listed as Tritonia sp. in Edmondson, 1946. Photo: CP: Maliko Bay, Maui; April 30, 2005.